Okay, this is embarrassing. I have been using grow lights to start my seeds indoors for years. I’ve done all sorts of things to hang the lights from the ceiling in my unfinished basement, including chains, ropes, and bungee cords. I’ve seen PVC frames, and keep meaning to build one. Well, I finally did, and guess what? It cost next to nothing! 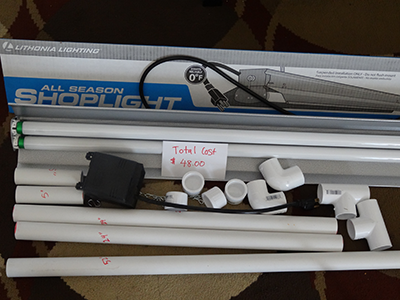 As you can see, the light, bulbs, and timer are the most expensive parts–adding the frame costs only $8. So if you are going to use grow lights–BUILD A FRAME! A few notes on supplies. You could use a different size PVC (1/2″, 3/4″, 1 1/2″), so long as all the pieces you buy will fit each other. 1″ is sturdier than 3/4″ or 1/2″, but cheaper than 1 1/2″. 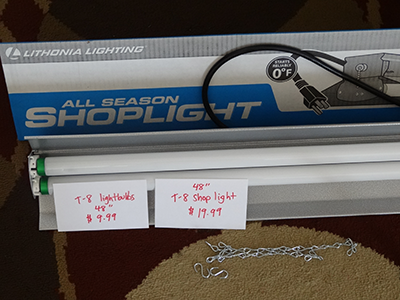 Home Depot had $12 shop lights, but they were T-12. The associate at the store told me that they are discontinuing T-12 lights and bulbs because they are not as efficient as the newer T-8. So I bought the T-8 for $20. 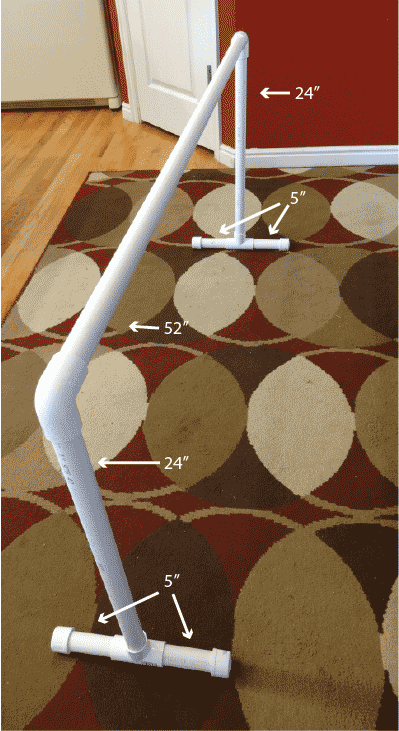 First, cut the 10′ piece of PVC pipe into several lengths. You can use a hack saw, or PVC cutters. Assembly is a snap, just put it together like you see in this picture. No need to glue the pieces together, just fit them snugly and they will be secure–when you’re done you can take it down and store it easily. The shop light should come with a chain and S hooks. I used these and just wrapped them around the top bar of the frame. It’s important to keep the lights about 1″ above the plants as they grow. I made my frames tall enough that I will have to add extra chain or rope to drop them lower, then I can raise them up as my plants grow. If (like me) you want to use two or three lights at a time, it’s easy to expand the frame! 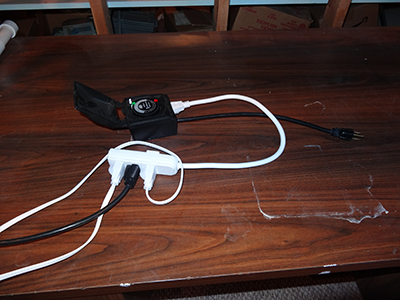 Because the timer will only have room for one plug, you will need to buy a power strip. 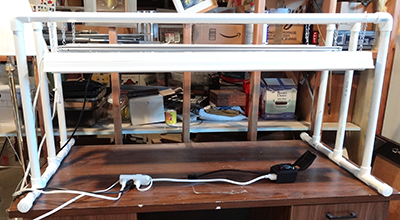 Plug the shop lights into the power strip, and plug the power strip into the timer. 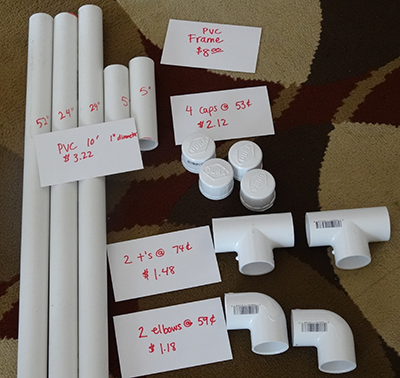 IMPORTANT: This time, cut the PVC pipe into these lengths. You will have a small amount leftover. Take the first frame and remove two of the 5″ pieces with caps. Replace them with 7.5″ pieces, add then build the rest just like the first. I made a video of the entire process, including how to add a second frame–that part starts about 4:30. So here’s how it looks all together with the lights installed. 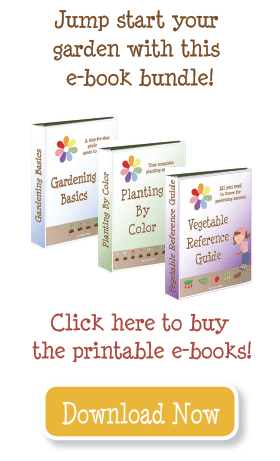 I can’t wait to start my seeds! Is it worth starting seeds indoors? Thanks so much! We just built a PVC light frame following your instructions. Your prices were spot on, and it was really easy. We wouldn’t have done this without your guidance, so thanks again! Just a cheap shop light is great, but the bulbs are best if they give full spectrum light. It’s great if you can buy one set of “warm” bulbs and one set of “cool” bulbs, and put one of each in each light. Is there any particular type of florescent light you recommend? Emily – very nice post! I really enjoyed the video showing exactly how easy it is to create a light stand – especially a multiple light stand. And so affordable. Thanks!